An outbound spam filter is not a mechanism one usually considers when evaluating the options for reducing the volume of spam mail a business receives. However it is an important feature of advanced spam filtering solutions that can prevent your business´s IP address being blacklisted. There are several reasons why your business´s IP address could be blacklisted for sending spam emails. A badly spelled email or an email with too many spam-related keywords could be quarantined as spam by an inbound email filter with a low acceptance threshold. The email sent by your business´s email account could be flagged as spam in error by the recipient and reported by their email service provider to a blacklisting agency – who would then place your business´s IP address on the Realtime Block Lists (RBLs) used by all email filters. The consequence of your business´s IP address being blacklisted is that none of your suppliers or clients would receive your business emails. They would either be blocked from delivery or quarantined as spam. Being removed from Realtime Block Lists is a time-consuming process and, while you are waiting, you would have to use alternate web-based email services to communicate by email. There are several – more disturbing – scenarios why your business´s IP address could be blacklisted. It could be the case that somebody is actually using your mail server to send spam emails – either an employee, or an outsider who has hacked into your system and stolen a user´s login credentials. The employee´s use of your email server is likely a serious disciplinary matter. But if an outsider has hacked into your system and acquired a user´s login credentials, your more serious concern should be what other information might they have acquired? In some circumstances, it is possible that your business´s IP address can be been blacklisted for sending malware-infected emails. The infection might not even be in your network. It may have originated from an employee´s infected home computer should they have prepared a file at home and attached it to a business email. Many advanced spam filtering solutions can check for malware and malicious links within inbound emails and their attachments using “URIBL” and “SURBL” databases. If a malware-infected email was received from your business email account, the recipient´s spam filter – or the intended recipient – could report your business´s IP address to a blacklisting agency. Prevent the spread of malware. SpamTitan Gateway and SpamTitan Cloud are WebTitan´s advanced spam filtering solutions. Both include an outbound spam filter that prevents all of the above scenarios by scanning your business´s outbound email for those that could be classified as spam or those that might contain malware. The two advanced spam filtering solutions also have efficient spam detection mechanisms for inbound mail – using a series of front-end tests to detect 99.97% of spam email – while dual antivirus software offers protection against phishing attacks and malicious URLs within emails and their attachments. The choice between the two advanced spam filtering solutions depends on each business´s individual circumstances. SpamTitan Gateway is a virtual appliance that is installed between a business´s firewall and its mail server. SpamTitan Cloud is a cloud-based anti-spam service that has a lighter maintenance overhead. Both solutions – and their outbound spam filter – are easy to install and manage. Administrators can configure and monitor the performance of each solution via a browser-based platform, while a comprehensive suite of reporting options will alert administrators to any instance of spam email or virus either inbound or outbound. 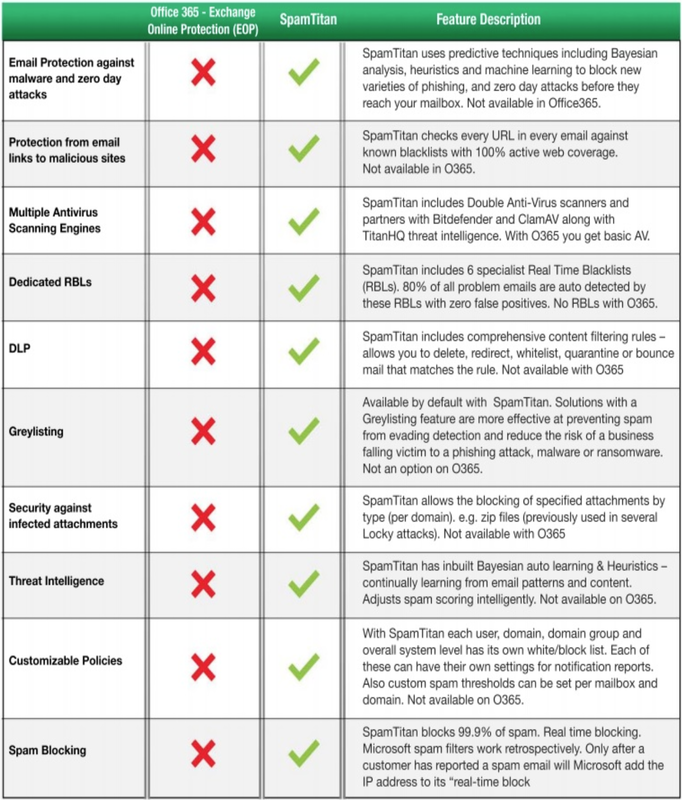 How Does SpamTitan Email Filtering Work? Many businesses use Microsoft Exchange or Office 365 for their email. Microsoft has incorporated several security features into its email offerings, although it is possible to greatly improve security with a more advanced anti-phishing, anti-malware, and anti-spam solution. Office 365 security can be strengthened to provide greater protection against malware, ransomware, and phishing attempts through a defense in depth approach. 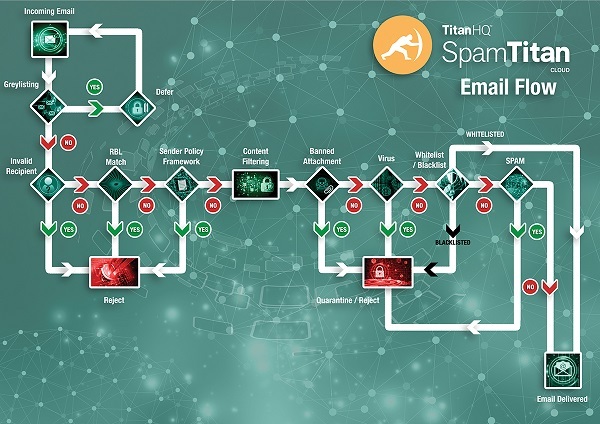 SpamTitan offers superior email filtering by using predictive methods to block new variants of malware, zero-day attacks, and spear phishing attempts, making sure these malicious emails are quarantined or rejected rather than delivered to inboxes. Organizations that rely on the cybersecurity protections of Exchange or Office 365 are likely to find a significant number of email threats are still delivered to end users’ inboxes. 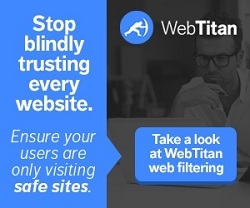 If you are concerned about how your business might be affected by the lack of an outbound spam filter, we invite you to try SpamTitan free for thirty days. Our offer consists of the choice of one of our advanced spam filtering solutions, full technical support and advice on how to configure your chosen filtering solution to achieve maximum effectiveness. Our offer is entirely free of set up costs. There are no contracts to sign, credit cards required or commitment to continue with our service once the free trial period has expired. To find out more about our invitation, or to learn more about the benefits of an outbound spam filter, do not hesitate to contact our team of Sales Technicians today. We also invite Managed Service providers and resellers to contact is and take advantage of our free offer. Both SpamTitan Gateway and SpamTitan Cloud are available in white label format for you to supply to your clients. We are also able to supply a range of APIs to integrate our advanced spam filtering solutions with existing third-party management products.